What does it take to create an effective business website? Well, first we should define that term. is highly efficient (returns your investment). Now that's what every small business owner want! Your website should pull its own weight and work hard for your business at all hours of the day. In a sense, your website can be likened to an experienced, hard working employee. In the beginning you had to train and direct them a lot, especially in the first weeks, but as time goes by they fall right into place and carry out their work effectively. But how do you get your website to that point? It takes a time and effort on your part in the beginning, along with a few key elements that are essential to building an effective business website. 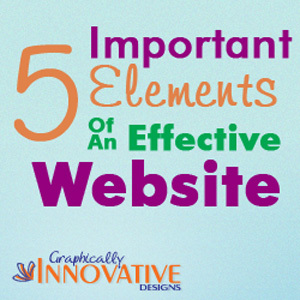 Here are 5 basic components that make a website work for you. If you don't have these components you could be missing out on untapped marketing potential a business website possesses. Search Engine Optimization (SEO) – About 74% of consumers use search engines to find local services and products. (Nielsen NetRatings) Is your website "findable" through keyword search? If not, then you need to implement SEO to drive web searchers to your site. Web searchers can't find you if the search engines don't know you exist. With SEO, your website can get found and indexed by search engines like Google, Yahoo and Bing. Once your website is indexed by search engines, it’s more likely to be found by potential customers. SEO is super important for small businesses in highly competitive industries. A Structured Navigation – Mapping out the navigational structure of a website is one of the first steps you should make when developing your layout. By doing so, it reflects well on the overall presentation of your site. You never want to frustrate your visitor just because they can't navigate easily through your website. A successful website will allow users to easily move from page to page without hitting a dead end or running around in circles. Having a structured navigation also ensures that the About page will not be stuck in the Menu section... of all places. And who's going to search aimlessly through your site in order to hunt down your contact info? A Visually Appealing Design – It may sound shallow but hey... visitors really do care about the look of your site. You have only 3-5 seconds to grab their attention before they may decide to leave and sadly never come back. So what makes a website visually appealing? To start, it should have readable type, an appropriate color scheme, graphics, visual balance and white space. Your website doesn't have to open with a "flashy" intro to be appealing... actually people are getting AWAY from that, rather it should complement your brand's overall look & feel and be unique to your business. This is not always an easy task to do on your own. That's why hiring a good web designer who has experience can be of great value. A Search Engine Friendly Design - Not only does an effective business website captivate the human eye, it also appeals to search engines. How do you appeal to robots? Search engines can't read images but they can read words. So to appease them, make sure your text is not saved as images. A Traffic & Statistics Tracking Tool – Would you ever go on a diet to lose weight and never track your food or how much you weighed every week? Without a tool to track the progress of your website you're basically doing the same thing... starting an unsuccessful plan with no results to be seen. A traffic and statistics tracking tool, like Google Analytics, helps you see where your visitors are coming from, how long they stay on a page and what are your most read pages. In the long run, you can use this information to learn what internet marketing strategies work best, how to attract more visitors, and what keeps visitors reading and coming back. A Responsive or Mobile-Friendly Website - **BONUS** This is a bonus item because, since writing this article a few years ago, responsive websites have grown in importance. Did you know that 72% of Consumers Want Mobile-Friendly Sites (Google Research). More and more people own smartphones and mobile devices like tablets, which in turn increases the demand for websites that adapt to those devices. So, why not give the consumer what they want, right? Who can do all of this? Not all of us like spending time on the computer coding and constructing a website. Nor do some of us have the TIME to construct a website... but I do! No matter if you own a website or not, I can help you get you on track. From start to finish, I'll help you establish your website as your primary marketing tool. Just contact me here to get started on an effective business website together!